The Agility packs are assembled with the aim of increasing stamina and endurance and, at the same time, aiding co-ordination and control. A team race promotes team-work whilst individual times could be noted to highlight any improvement. Any opportunity to run and leap always provides a lot of fun which encourages participation. 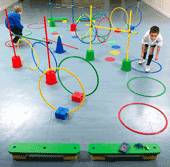 Agility Pack A provides an Activity Sheet, but there many other variations that can be made from these kits. Contents may vary due to stock availability but, where possible, will be replaced with an item or items of a similar value.